Post Traumatic Stress (PTS) and the suicide epidemic have been at the forefront of Veteran’s issues, stimulating a lot of discussion about why so many of our Warriors are taking their own lives. PTS is probably the most misunderstood condition in our society, causing our Warriors to become the most misunderstood people. The mystery that surrounds PTS is hardly reasonable, given the fact that PTS is nothing new. Prior to 2014, it was believed that the earliest historical documentation of PTS dated back to the Greek Historian Herodotus’ account of the Marathon Wars in 490 BC. However, new research has shown that even earlier evidence of PTS exists in the medical documentation of the Assyrian Dynasty from as far back as 1300 BC. What is most surprising is not the fact that PTS existed in those times, but rather the fact that this ancient culture seemed to have a better grasp on the issue than our culture does today. Indeed, “those who cannot remember history are doomed to repeat it,” and since our culture has dismissed the lessons learned by our ancestors, we have paid a dear price. Just a few months ago, I was speaking to a Four Star General whose name I will not repeat here. As we spoke about the issue of PTS-related suicide, the General asked me, “What is it with your generation of Warriors? Did your mothers just coddle you boys too much?” I replied in a way that a true politician would understand, and avoided answering the question directly. Whether we want to admit it or not, many, especially the generation of leaders holding the cards and the power, feel that Post Traumatic Stress is a sign of weakness. Perhaps that’s part of why we have seen so little movement on the issue. I guess walking up a hill both ways to school doesn’t make you immune to changes in the brain that occur during combat. No matter how tough you are, you can’t escape the psychological impact of war. It isn’t anything to be ashamed of either. It isn’t an issue of strength or weakness. It’s a matter of existing on this earth as a human being and experiencing extreme stress and trauma. When a person goes to war, the brain changes. The Limbic System, which manages the fight or flight response, is essentially “getting a workout” which causes it to become hyperactive. Because the brain operates in a balanced way, an increase in activity in the Limbic System simultaneously causes a decrease of activity in the Prefrontal Cortex. The Prefrontal Cortex is the part of your brain that enables you to make good decisions and experience love and compassion. If the Limbic System is hyperactive, you will experience more fear, anxiety, panic attacks, irritability, nightmares, and paranoia. At the same time, diminished Prefrontal Cortex activity will prevent you from being able to feel connected to others or exercise good judgment. What our Warriors are experiencing today is the same post-war problem that Warriors throughout history have experienced. The primary difference is that our culture is not as well suited to HEAL our Warriors. The only way to heal Post Traumatic Stress is to restore the balance in the brain, by strengthening the Prefrontal Cortex, causing the Limbic System to relinquish control. In other words, we need to workout our Prefrontal Cortex, which is possible by practicing meditation or yoga regularly. Unfortunately, only a few organizations, including Save A Warrior, are committed to teaching and instilling a regular meditation practice. In the ancient world, meditation was commonly practiced in nearly all cultures in different forms. Furthermore, historically, human beings have existed in societies where mental rest was part of a typical day as there were fewer distractions. In our culture, we are bombarded with tasks, information, and other stimuli constantly. Smart phones, computers, video games, emails, and text messages have filled the gaps of a routine schedule. For us, the opportunity to relax is minimal unless we intentionally seek out moments for recuperation. Another key difference between our society and those of the past is the fact that our ancestors understood the vitality of incorporating spiritual practices and rituals in the healing process. For those suffering from moral injuries, faith and spirituality are essential components of healing. Moral injury is characterized by the pain, grief, and sadness one feels when exposed to traumatic situations that injure the psyche and/or soul as a result of violating moral, spiritual, cultural, or personal norms of behavior. For example, taking the life of another human being is not easy. Sure, you might have been "doing your job,” but nearly all Warriors who take the life of another human experience long-lasting grief that resonates deep within. Those who don't can generally be characterized as sociopaths. Survivor’s Guilt is another example, as many Warriors feel guilty for not being able to save the life of a fellow Warrior. There is no medication on the planet that can heal the heart of such grief, guilt, shame, or sadness… Healing must come from somewhere else. In our culture and military training, we are taught to deal with these feelings by burying or hiding them. Many of us just pretend as if those things didn’t happen at all. We just ignore it and try to move on. Unfortunately, human beings can’t operate that way because we cannot selectively numb emotions. If you numb one emotion, such as fear or sadness, you numb all emotions, including joy, happiness, and love. Without the beautiful emotions, we lose the will to live. In ancient Warrior cultures, including the Navajo and Assyrian cultures, rituals were used to support Warriors as they left behind the painful memories of combat. They understood the power of bringing Warriors together in a group, having them acknowledge their pain together, and then engaging in a physical activity that defined and marked a moment in time when they let go of the past. Many of our Warriors experience shame for being in psychological distress, because they perceive it to be as a result of weakness of character; this is what our culture has taught them. In reality, what they are experiencing is simply a result of being human. When they learn the reality and scientific explanation for what is occurring, and are able to share their experiences IN A GROUP and see that their fellow Warriors feel the same way, it ameliorates the shame and provides healing. In Nothing New under the Sun: Post Traumatic Stress Disorder in the Ancient World, the authors point out that the Assyrians used two types of healers to treat PTS. The asipu was a spiritual healer, while the asu was a medical healer. The two worked together to form a holistic model of healing. Warriors often dwell on the loss of their comrades, wondering what they could have done differently to save them. However, the past is in the past, and dwelling on negative circumstances such as this is called rumination. Rumination damages the brain, causing further hyperactivity to the Limbic System. Although it is unlikely that the Assyrians understood the neuroscience behind this in the year 1300 BC, it is obvious that they understood the importance of leaving behind painful memories. The above-mentioned ritual is designed to help Warriors separate with the past, as the grief-stricken Warrior says goodbye to his dead friends, once and for all. Warriors from Cohort 013 walk a labyrinth, which is an ancient contemplative practice that helps Warriors to reflect internally and leave behind painful parts of their pasts. Photo courtesy of Garrett Combs. At Save A Warrior, we do a similar ritual, called The Ceremony for the Dead, as described in Karl Marlantes’ book What it is Like to Go to War. This ceremony, and the similar activities we use at Save A Warrior are uniquely designed to heal our Warriors minds and souls so that they can move forward in life unhampered by painful memories. In our disconnected culture, engaging in such activities seems unfamiliar and bizarre. We’re dangerously out of touch with reality. Post Traumatic Stress and Moral Injury can’t be fixed with a pill or by some distant therapist who hasn’t the slightest idea of what it’s like to stand in the boots of a Warrior. Something as deeply disturbing as the memories of war must be dealt with on a spiritual level. We must come together and reach deep into the grieving soul to part with those memories that no longer serve us. 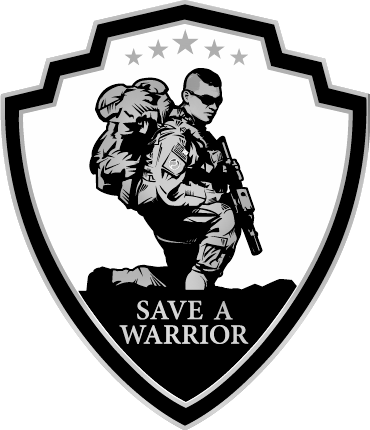 Ancient documents and stories describe how our ancestors dealt with PTS by attacking it holistically, while Save A Warrior has implemented many of the same practices with a 100% success rate at reducing symptoms of PTS and saving lives of suicidal Warriors. On the other hand, studies show that only 16% of Warriors undergoing treatment at the VA for PTS report that it was beneficial for their health. The same amount reported VA treatments made their condition worse.